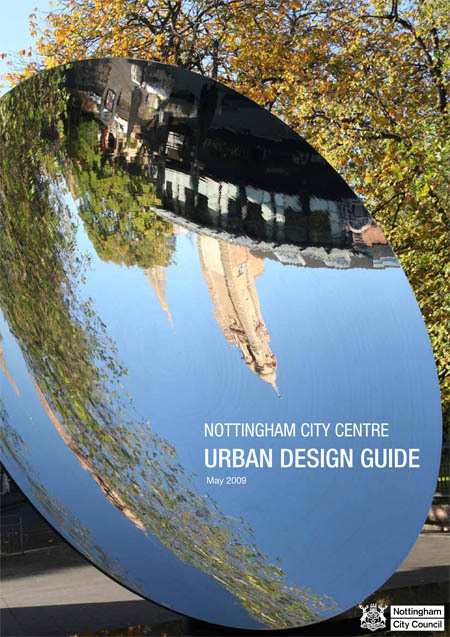 Nottingham City Council and Nottingham Regeneration Ltd.
Late in 2007 URBED were commissioned with Gillespies and Savills to prepare an urban design guide for Nottingham City Centre. This was published for consultation in November 2008. The guide has been developed through an intensive series of discussions. Rather than including vague principles or motherhood and apple pie homilies about urban design, the guide is based on a technique that URBED uses for masterplanning. Nottingham had a masterplan for the city centre approved in 2005 and the design guide ‘codes’ this plan. It specifies a building line to set the position of new buildings, outlines the nature of the public realm and the heights of the buildings, before looking at uses and active frontages, sustainability and design. The aim is to create a flexible framework in which developers have the freedom to innovate within; but which also creates a coherent urban form for the city centre as a whole. After a consultation period the guide was amended and adopted as Planning Policy (not SPD) by the Council.